I came to learn about polite behavior this past week. Or, at least how polite people behave in my condo. In reading the condo newsletter, which is still printed and distributed to everyone even though my condo promises it is ‘green’, I learned that polite people have superior cook smell management skills. 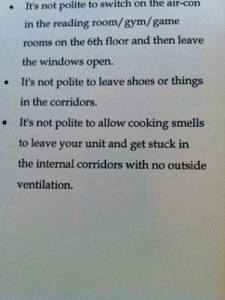 Namely that polite people don’t allow cooking smells to leave their unit, and if they do, they don’t allow them to enter an internal corridor with no outside ventilation. I am not sure I can heard my cooking smells in a polite way, I will ask management to add better ventilation to the corridors. In over a year, this is the first time I have read the newsletter. Based on the gems of knowledge I found in this edition, I’ll be a loyal reader from now on. This entry was posted in Bangkok and tagged Bangkok, condo, polite, Thailand. Bookmark the permalink.